Cox Law Office is located in a historic building in the Herron Morton Place Neighborhood. 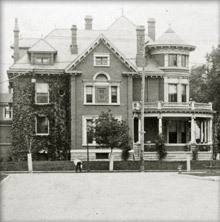 Built in 1896 by Phillip Goetz, the secretary/treasurer of the Indianapolis Bicycle Company (that later would become one of Indiana's first automotive companies), the building would later serve as residence to notable Hoosiers such as Wilmer Christian and Dr. William Wishard. Unfortunately, with the advent and growing popularity of the automobile came an increased need for wider roads in this historic district. The southern half of the building was demolished sometime prior to 1927 to allow for the widening of the intersection at 16th and Delaware. During the Depression and through the mid-1900's, the building was used as a boarding home and for a variety of other purposes, including the attachment of a public service billboard that remains on the building even to this day. In recent years, Herron Morton Place Neighborhood and other historic downtown Indianapolis neighborhoods have been subject to extensive restoration and community building efforts. With this goal in mind, Cox Law Office purchased the 1606 N. Delaware building and worked with the Indianapolis Historic Preservation Committee to renovate and restore the exterior and interior of the building. Now, over a hundred years after it was originally constructed, 1606 N. Delaware has become the principal offices of Cox Law Office.